Because smoke rises, mount detectors high on a wall or on the ceiling. Place them in an area away from air vents. The basement ceiling near the steps to the first level is a good location. 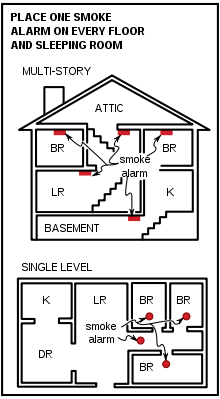 But don’t install the detector at the top of the basement stairs where there is a closed door, dead air space near the door may prevent smoke from reaching the detector. There is more to checking a smoke detector than just pushing the test button. Dust and even small insects can sometimes block a photo-eye type or ionization type of smoke detector. They also should be cleaned periodically. Don’t go to long before changing batteries. If they are hard wired make sure they have a battery back up. Smoke detectors should not be taken lightly. They could save your life.